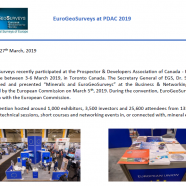 EuroGeoSurveys recently participated at the Prospector & Developers Association of Canada – PDAC which took place between 3-6 March 2019, in Toronto Canada. The Secretary General of EGS, Dr. Slavko Solar participated and presented “Minerals and EuroGeoSurveys” at the Business & Networking Breakfast organized by the European Commission on March 5th, 2019. During the convention, EuroGeoSurveys shared the booth with the European Commission. The convention hosted around 1,000 exhibitors, 3,500 investors and 25,600 attendees from 135 countries, including technical sessions, short courses and networking events in, or connected with, mineral exploration.